Posted on Sun, Nov 22, 2009 : 6:01 a.m. 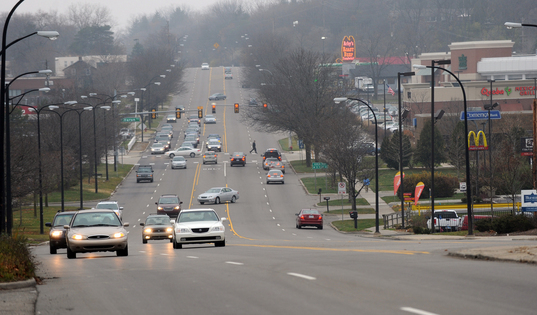 This view shows Washtenaw Avenue, looking west from Arborland Mall in Ann Arbor Friday. Planners have dubbed the five-mile stretch of Washtenaw Avenue from Stadium Boulevard in Ann Arbor to the water tower in Ypsilanti as the Washtenaw Avenue Talent Center. And they have a bold initiative for it over the next 10 to 20 years. Its creators say the plan aims to reduce sprawl and increase density along the route, relying on the rising demand for public transit and pedestrian-friendly connections. Features include reduced building setbacks, mixed-use development and affordable housing that will help Washtenaw County retain talented young residents. Development would concentrate along transit “nodes” on the route. “We’re imagining that there are areas that could definitely support three-story buildings,” said Anya Dale, senior planner in the Washtenaw County Office of Strategic Planning. The initiative was an outgrowth of strategies generated by A2Success.org. Coordinating public investment and multi-jurisdictional master planning will be a key aspect of the redevelopment plan, Dale said. She spoke of “restructur(ing) the way Washtenaw works” to create more of a “downtown” feeling. She named Madison, Wisc., Boulder, Colo., and Portland, Ore., as leading models of mixed-use, high-density development. Ypsilanti planning commissioner Cheryl Zuellig commended Dale and Ypsilanti Planning Director Richard Murphy for creating “a lot of momentum” through their work on the plan. ZuelligÂ was named to serve as the commission’s representative on the joint technical committee that will work out details with local governmental units, residents, funding sources and developers if the proposal advances. Dale said it's possible a corridor authority with its own zoning powers will be formed. The planning commission also received an 84-page draft of a nonmotorized transportation plan authored within the city’s planning department. It addresses issues like bicycle parking and snow removal at driveway crossings and intersections. Fencing that interferes with pedestrian crossings is another issue. The plan goes to the Ypsilanti City Council for a 60-day review period before returning to the planning commission for a public hearing. Wed, Dec 2, 2009 : 2:43 p.m. I'm now raising my hand in response to the Happy Senior's facetious question. My wife and I purchased a home in this area precisely because of the access to public transit, and proximity to shopping that allows us to get by without using our car most of the time. But we were lucky to find something, because there isn't much housing available in higher density, mixed-use developments. Anything the "action team" can do to improve the availability should help attract and retain more young (and old) professionals. Mon, Nov 23, 2009 : 3:28 p.m. In response to Whither Detburger, the presenters mentioned that demand for transit is there and this route is AATA's most popular. The long travel time is acknowledged. A solution that's part of the plan is to cluster bus riders at the transit nodes so there would be fewer stops and faster progress along the route. Mon, Nov 23, 2009 : 2:01 p.m. This is a longstanding grievance of Ypsi commuters, but an express bus from downtown Ypsi to downtown A2 would seem to provide a lot of benefit for little cost. As it is, a 20 minute car commute takes an hour (!) on the bus during rush hour. I would take the bus every day if it didn't cost me an hour of my life. Charge extra, if you need to. I bet AATA could actually turn a profit on that route (for a change). Mon, Nov 23, 2009 : 12:04 p.m.
Several commentors mention auto traffic congestion as a concern on Washtenaw Avenue. Various sections of Washtenaw Ave are M-17, US-23 business route, and I-94 business route - auto traffic will definitely have to be considered in any planning efforts on the corridor.. Part of redevelopment along the corridor would be implementation of the "Access Management Plan" that MDOT and the municipalities prepared in 2007. This plan addresses intersections, driveways, and other potential "conflict" points in order to smooth traffic and improve the roadway's functioning and capacity. Redevelopment can often be the best opportunity to do this implementation, in fact - it is easier to coordinate a new development's driveways and parking than to think about combining or realigning driveways for existing businesses without making other changes.. Addressing traffic congestion could also include providing better alternatives to drivers on the corridor. Certainly, transit, walking, and biking can't serve everybody currently driving on Washtenaw, but could be looked at as ways to allow some drivers to get to their destinations without driving. Mon, Nov 23, 2009 : 11:05 a.m. The most exciting part about this story - that several units of government would actually work together to realize the same vision. We're all in this together, and the sooner we shape and execute land use, transportation, and job creation plans that benefit an area larger than city or township boundaries, the better we will all be. Washtenaw Ave. could be so much more than it is - human beings designed this street solely for car-users, and human beings can redesign it for so much more than it is today. Sun, Nov 22, 2009 : 9:45 p.m.
As a proud Ann Arborite who lives in the "ugly Ypsi" part of town as described by genericreg -- that is, east of Huron Parkway and a few blocks south of Washtenaw -- I'm not sure just what to think here. On the one hand, that comment is clearly intended to be an insult directed at Ypsi, as well as the area of Ann Arbor in which I live, so perhaps I should be taking offense. On the other hand, I've never found anything about Ypsi to be insult-worthy. I certainly enjoy going there to visit friends, attend events on the EMU campus, and patronize numerous fine restaurants. I particularly relish Depot Town, near which I lived many years ago, but I've had enjoyable times in downtown and other sections of the city, too. So -- given that -- it would seem that I SHOULDN'T resent being placed in the "ugly Ypsi" locale. AndyYpsilanti -- I think I would have written exactly the same thing that you did. Sun, Nov 22, 2009 : 9:11 p.m.
Brett Lenart works for the (soon to be history) Washtenaw County Office of Strategic Planning. For what town is he a planning commissioner? Sun, Nov 22, 2009 : 8:27 p.m. The impossible sidewalk situation on Washtenaw should be job 1 even if they do nothing else. People walking or handicapped people with wheelchairs and scooters could go up Washtenaw even without a bus if the sidewalks didnt stop and start, with no curb cuts, and change from one side of the street to the other randomly again without curb cuts. Its a horrible hodgepodge of sidewalk danger. Sun, Nov 22, 2009 : 6:01 p.m. Increased density, mass transit, and non-motorized transportation are all good. But what appears to be totally missing is any thought as to how to make traffic more orderly and less congested. What is already a disaster at peak times is only going to become more of a grid-lock as you add density. Even if you improve alternative means of transportation, I doubt that there will be fewer vehicles using the Washtenaw corridor without a major change in how we all travel. That is still many years away. The corridor is still going to be a major commuter route and a primary means to access downtown and the universities for the foreseeable future. Let's get the traffic flow figured out and fixed first, then coordinate the development with it. Otherwise, we are just prettying-up businesses and buildings that we still can't get to! Sun, Nov 22, 2009 : 5:31 p.m.
With all of the intense traffic at the US-23 &amp; Washtenaw Av interchange, they should spend some time in upgrading that junction. I'd like to see a single-point interchange created at that spot similar to the one they have at US-23 &amp; M-59 near Hartland. I quit using that exit en route to EMU and have found a back way in but I sometimes use that exit for other uses and it's a pain with traffic and the long lights. Sun, Nov 22, 2009 : 1:52 p.m.
Sun, Nov 22, 2009 : 12:21 p.m.
Everyone raise their hand who believes that what keeps young professional is this area is a pretty to look at drive between Ann Arbor and Ypsilanti. Anyone? Anyone? Whose vested interests are being served by text such as: public transit and pedestrian-friendly connections....reduced building setbacks, mixed-use development and affordable housing that will help Washtenaw County retain talented young residents. It is jobs that "retain talented young residents" as well as middle-aged and older residents. It is JOBS. Here is another high cost project that government people think is important. That stretch of road was dismal in the 60s when I moved to the area. We've had good times and bad times since then. Who believes any of it was caused by the lack of places to lock up a bicycle and how close buildings were to the road? What does this mean: "a corridor authority with its own zoning powers will be formed." Are city governments ceding their authority to a "corridor authority?" I'm a voter and I'm not. Sun, Nov 22, 2009 : 11:42 a.m.
genericreg - what in the world are you talking about???? Where does Dexter start? At Stadium and Pauline? Sun, Nov 22, 2009 : 11:26 a.m.
@Genericreg, There are two Arby's restaurants on Washtenaw. The one in Ann Arbor has an outside restroom. That's embarrassing. Sun, Nov 22, 2009 : 11:01 a.m.
That's ok, generlcreg. In Ypsi we consider anything west of 23 useless, simply because its so stuck up and self righteous. Sun, Nov 22, 2009 : 9:11 a.m. Bringing into Ann Arbor folks who could only afford to live in Ypsilanti may help Ann Arbor Public Schools' revenue over the years.